In modern day, people see large-scale open-world RPGs with beautiful graphics and realistic NPC dialogue. The NPCs nowadays have voices and even semi-dynamic conversations. It is true that games which emulate a realistic world are immersive and compelling experiences, but there are other ways to become immersed. Dialogue in the form of text makes the player consider their actions much more closely. There is no rhetoric or emotion that comes from voice-acting backing the world. Any important dialogue the player encounters must go through a filter of textual analysis and perception that humans automatically perform when they’re reading. How do you know if someone is insulting you, or joking with you? How can you tell if someone lies to you? Whether they’re happy, or sad? There are no vocal cues. Context words help, but largely, it’s up to the player to interpret their interactions with NPCs in Morrowind. To the point, this means the player has a big hand in building their experience of the world around them. 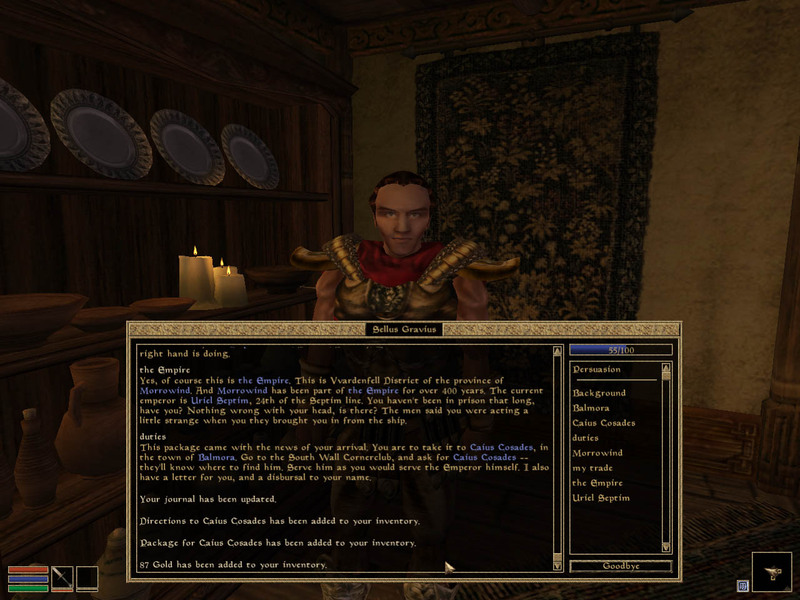 In Morrowind, words aren’t spent on describing an environment like in novels – it’s provided by the game’s graphics. This allows an interesting relationship between dialogue text, the player, and the world’s inhabitants to unfold inside of the game’s setting. When the old drug-addicted man, Caius Cosades, tells you he is an Imperial spymaster, do you believe him? If someone tells you that they need help and to follow them, is it a trap? When someone tells you a Dwemer ruin is completely safe, is it really? You usually realize it isn’t after there are 20 robot-spiders coming after you. These are real questions I asked myself – questions I don’t ask in other games. I found that the dialogue box actually added ambiguity to the NPC’s intentions as I played which fits in perfectly with Morrowind’s gothic, grimy, and untame world. 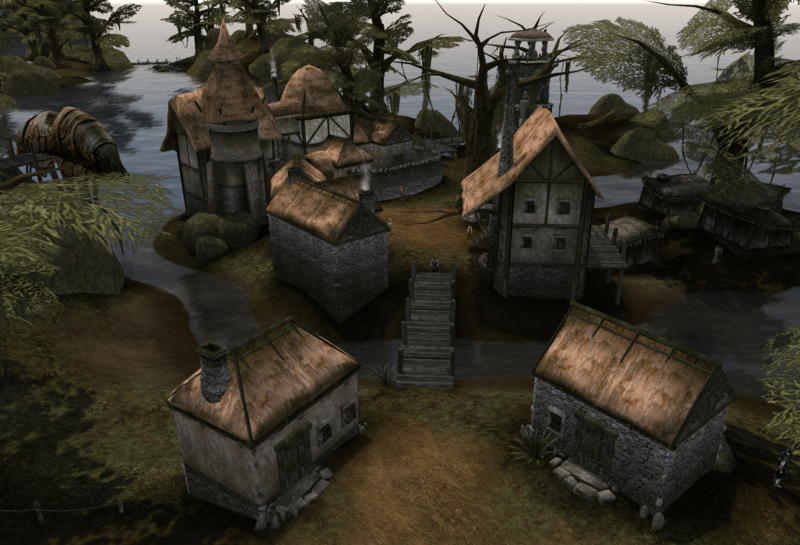 Morrowind makes the player feel uneasy – unsure. The game gives little direction in telling the player how to feel, or who to trust, and this is amplified by the textual dialogue menu. This game is all about figuring things out yourself. You don’t even get a compass pointing you towards objectives (as we are accustomed to in modern RPGs). You have to read and remember NPC’s textual directions to get to a quest spot. Today, I feel a lot is handed to me in games – I don’t feel apprehension from a new, scary dungeon. I never get lost. I am never unsure about who is against me, or with me. 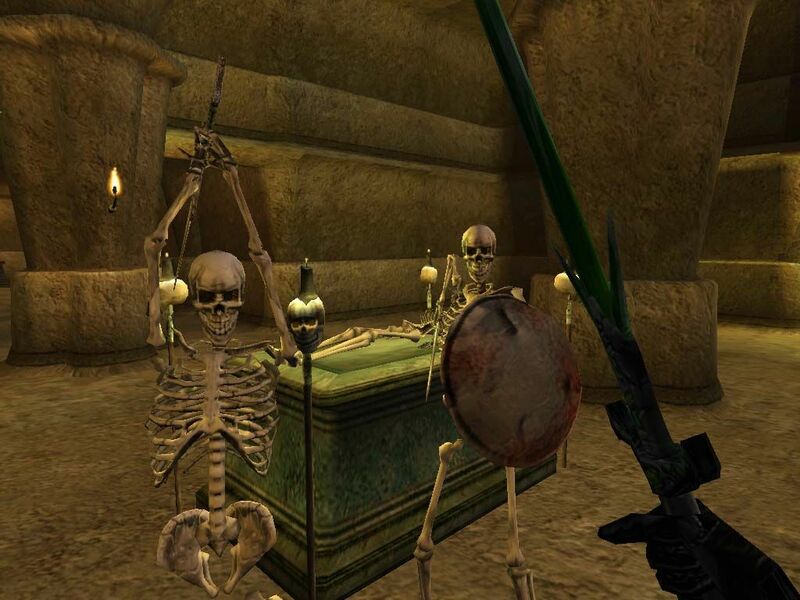 Morrowind throws all that… well, to the wind. It came out in 2003, but it is one of the most immersive games I’ve played in 2018, and I feel a great part of that is owed to the dialogue menu. If you aren’t afraid of reading some, check this game out.